The Version Control > Common settings page features common settings for version control systems, such as commit message line wrapping and checking options. Submit message checking script is a script or program that can be used to perform checks on the submit message before submitting. The submit message is passed in as the script's first parameter. If there is an error, the script should output a message on standard error and return a non-zero exit code. 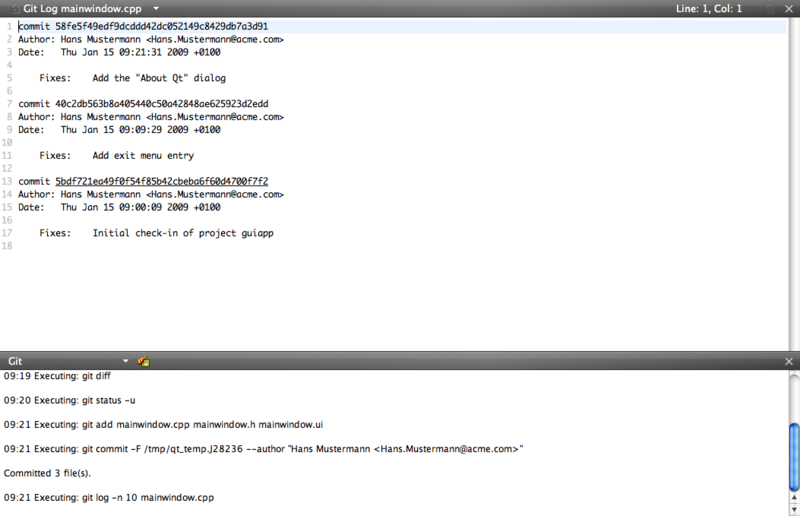 Notice that the second line specifies the alias hm and the corresponding email address for Hans Mustermann. If the user/alias configuration file is present, the submit editor displays a context menu with Insert name... that pops up a dialog letting the user select a name. These fields appear below the submit message. They provide completion for the aliases/public user names specified in the User/alias configuration file as well as a button that opens the aforementioned user name dialog. The version control sub-menus are in Tools menu. The version control system managing the current project is displayed here. Each version control system adds a pane to the Application Output panes within which itlogs the commands it executes, prepended by a timestamp and the relevant output. When you create a new file or a new project, the wizard displays a page asking whether the files should be added to a version control system. This happens when the parent directory or the project is already under version control and the system supports the concept of adding files, e.g., Perforce and Subversion. Alternatively, you can add files later by using the version control tool menus. With git, there is no concept of adding files. Instead, all modified files must be staged for a commit. All version control systems provide menu options to diff the current file or project: to compare it with the latest version stored in the repository and to display the differences. In Qt Creator, a diff is displayed in a read-only editor. If the file is accessible, you can double-click on a selected diff chunk and Qt Creator opens an editor displaying the file, scrolled to the line in question. Annotation views are obtained by selecting Annotate or Blame. 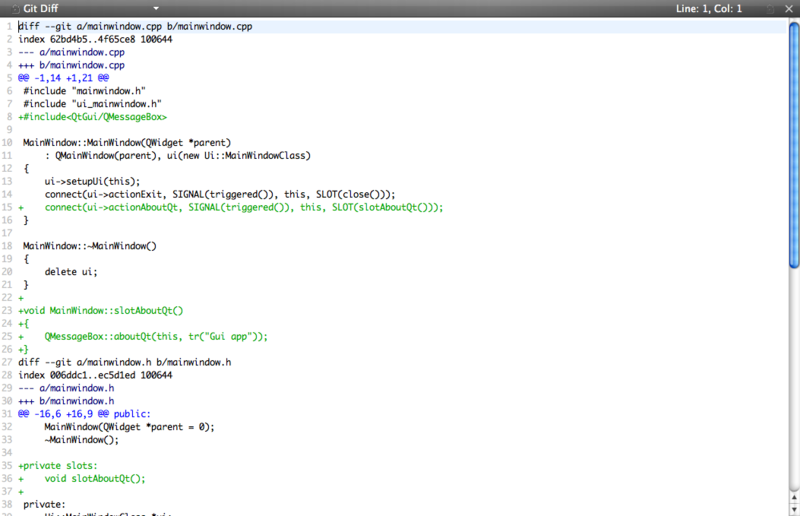 This displays the lines of the file prepended by the change identifier they originate from. Clicking on the change identifier shows a detailed description of the file. Once you have finished making changes, you can submit them to the version control system by choosing Commit or Submit. Qt Creator displays a commit page containing a text editor, where you can enter your commit message, and a checkable list of modified files to be included. When you are done, click on Commit to start committing. In addition, there is a Diff Selected Files button that brings up a diff view of the files selected in the file list. Since the commit page is just another editor, you can go back to it by closing the diff view. 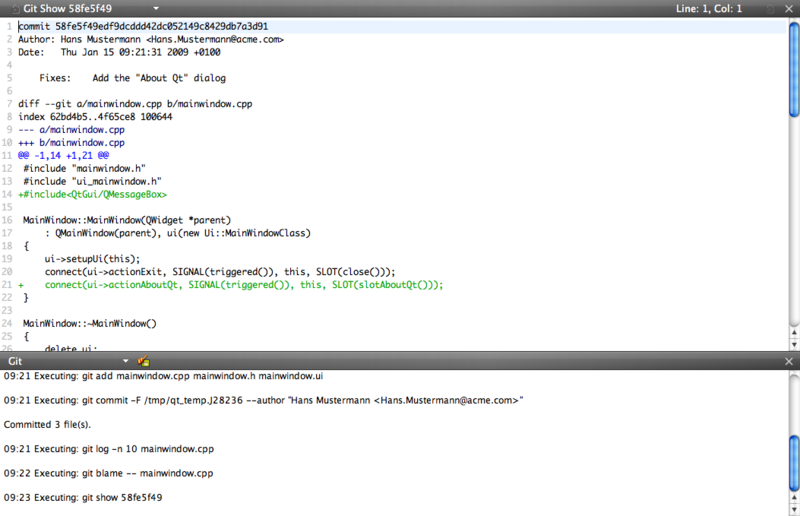 Alternatively, you can view it from the editor combo box showing the Opened files. 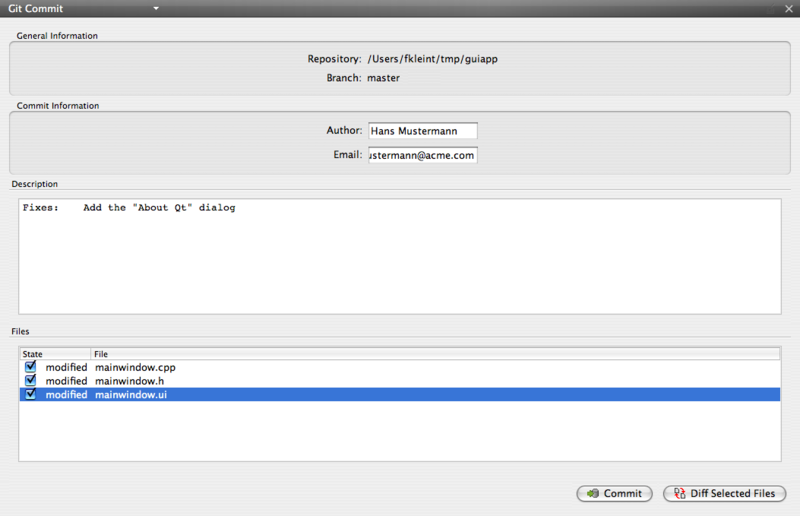 The versioning history of a file is displayed by selecting Log (for git) or Filelog (for Perforce and Subversion). Typically, the log output contains the date, the commit message, and a change or revision identifier. Click on the identifier to display a description of the change including the diff. Stash Stash local changes prior to executing a pull. Pull Pull changes from the remote repository. If there are locally modified files, you are prompted to stash those changes. Branches... 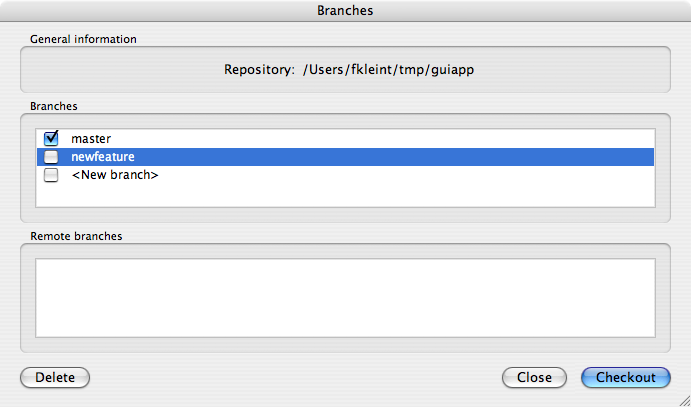 Displays the branch dialog showing the local branches at the top and remote branches at the bottom. To switch to the local branch, double-click on it. Double-clicking on a remote branch first creates a local branch with the same name that tracks the remote branch, and then switches to it.